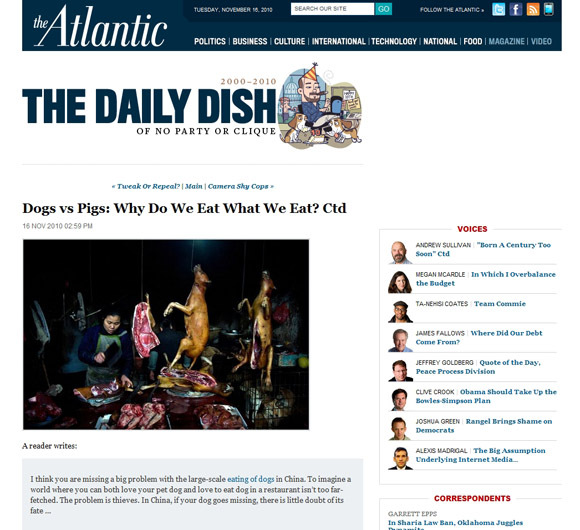 My photo of a dog butcher in Yangshuo, China, was featured as part of a discussion on eating dog meat in China on Andrew Sullivan’s Daily Dish blog for the Atlantic. Thanks to Chris, Katie, and the rest of the crew behind the scenes at the Atlantic. Long a favorite magazine–I’ve subscribed on and off (off when I’m out of the country) since high school–I’m glad to know there’s such a great team behind the magazine.